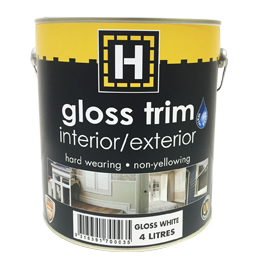 H-brand gloss trim is a self cross-linking 100% acrylic architectural paint which has a specially formulated "non-stick" finish. It combines easy application, low odour of a water-based paint with the self-levelling and toughness of an alkyd enamel. Sizes 500mL, 1 Litre, 2 Litre, 4 Litre, 10 Litre.